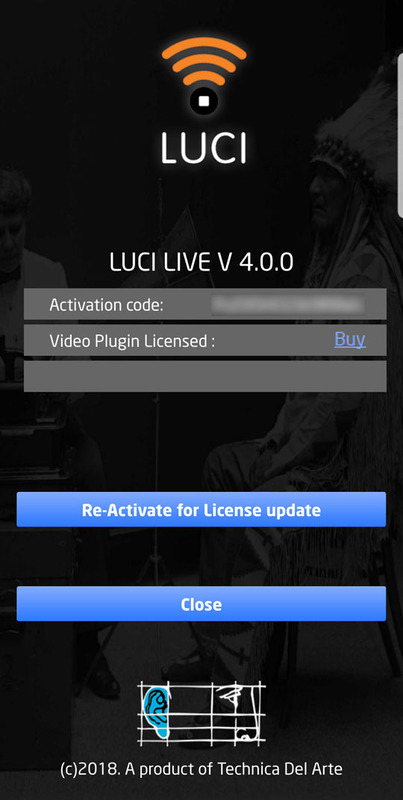 With a Video plugin license LUCI LIVE can be setup to stream Video, captured from the phone camera(s). 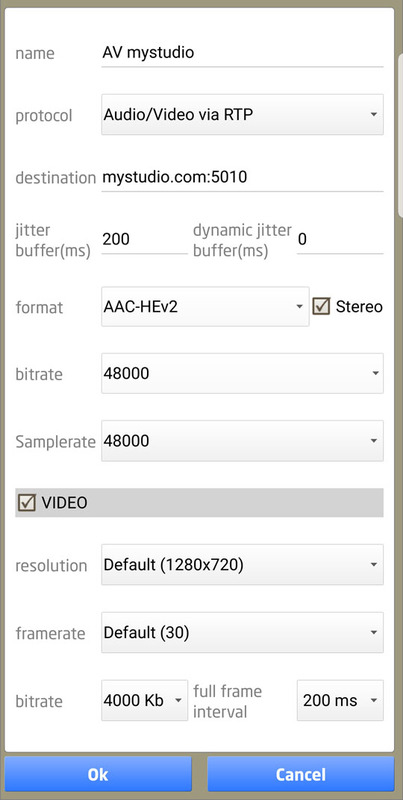 The currently supported format is H264 with bitrates up to 4Mbps. The video can be recorded separately in an mp4 file, and combined with the separately recorded audio file with standard video editing software or with our FTP function. First Setup the video input by selecting the settings menu item Choose Camera. The window will show the available device cameras. Select the camera, and the default Resolution and Frame rate of this device. 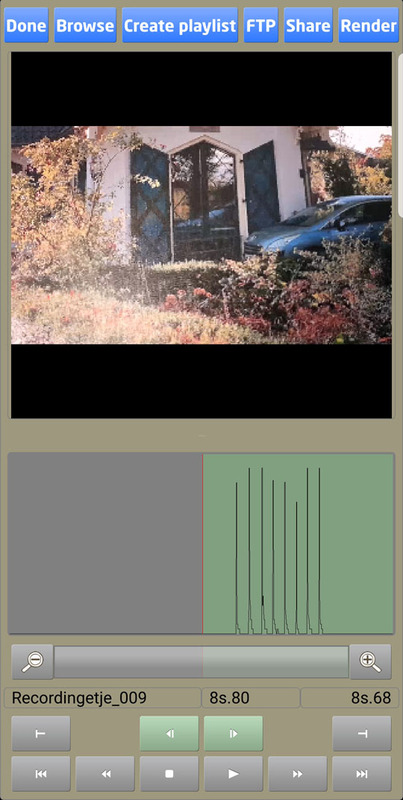 When the Video Checkbox in the Stations profile is selected, the main screen flips into video mode; The main window of the LUCI Live application switched to landscape view. On pressing the Microphone button, the camera preview is shown. When pressing the Connect Button, the audio and video will be send by separate RTP streams. The picture shows the user interface of the LUCI LIVE Video application when the camera is not switched ON. The utility of the main user interface is equal to the Audio-only version, the explanation can be found in the Manual for LUCI Live – Android. Audio and video are saved in 2 separate files. To combine the 2 files you can either use a 3e party Video Editing Suite, or publish it using our FTP , Share or Render function. Before publish the file you can set a start and end point with the LUCI LIVE Editor. When using FTP the new audio file and a video with the audio combined are send to the FTP server. When using Render a new audio file is created with a video combined with the audio is created ( auto named “_final” ). When using Share only the video combined with the audio file is send (auto named with timestamp ). There is a dragging bars between the video and audio area you can move to size the video / audio areas. You can set a different begin and end point from the audio timeline ( see section Audio Editor ). The selected area will be highlighted in the waveform screen and only this part of the file will be published. You can publish the selection you made with FTP. A known difficulty is the synchronization of the audio and video streams / files. As they are captured separately, the synchronisation depends on the capturing latency of the audio versus the video frames and can cause some unwanted synchronizing delay. Therefore it is best to use a 3th party video editor to combine the 2 separate files were you can shift the audio and video in time to synchronise it.